At least 2 other times it speaks of crying out to God and Him hearing us. That is so comforting to me. It reminds me that I am not alone. Looking back at my life I see that He has always been there with me, comforting me, loving me, caring for me, and alot of the times carrying me. After my husband and I had our twins our income had been drastically reduced and even completely gone. At times we wondered would there be enough for our household of 7. But God reminded us constantly through His Word and His on time provision that He heard our prayers. That we were not alone. Our faith has increased and become firm in Him because of all of the adversity in our lives. These times have allowed opportunity for God to show himself to us. We have had miraculous favor in our time of need. 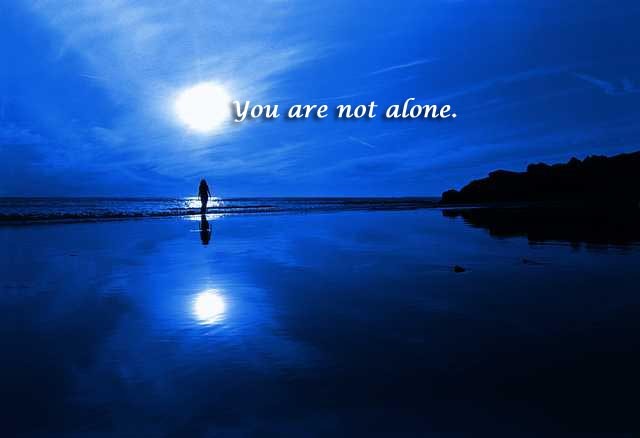 We know we are not alone and that we will never be left alone. I have realized that as a child of the Almighty God I will always have everything I need because He provides all my needs from his riches and glory. Just like He was with Shadrach,Meshach, and Abednego in that fiery furnace He is with us. I have learned to praise God at all times no matter what happens because my God is Faithful and True. Over the years, I remember dealing with my struggles “alone.” It wasn’t too long ago that I was continuously reminded that I am NOT alone in my strifes. And knowing that the Lord is always with me and guiding me through makes my obstacles so much smaller. His unrequited love quenches my thirst for life and I want to live by His word.Our God REALLY IS an awesome God! !